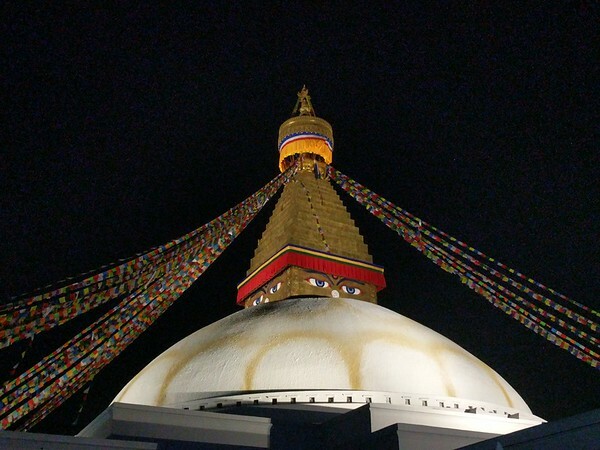 Be sure to read my follow up post about trekking in Nepal after the conference! This is post closely mirrors my trip 2 years ago to attend SANOG 27: a conference followed by some awesome tourism. Like before I was luck to have my work send me to APRICOT 2018 and was again humbled to have my talk selected for presenting. 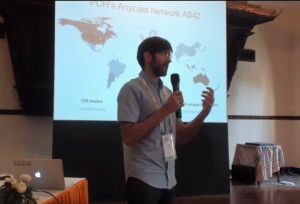 APRICOT is the “Asia Pacific Regional Internet Conference on Operational Technologies”. It’s more or less a larger SANOG meeting encompassing a greater regional area so more folks come. However, a lot of the usual suspects were in attendance (if I can get away saying that having only been to two conferences in Kathmandu ;). Note: All links below have full YouTube streams to watch and decks to download. Be sure to click through if you’re interested in knowing more about any of them! Daniel Griggs of NZRS gave a fun talk, “Accidental Data Analytics” that was eerily similar to mine and presented immediately before me. Yasunari Momoi and Kota Kanbe’s talk “Vuls & VulsRepo” was…just pure awesome. Especially Kota’s half of the talk. He’s inspired me to do a pull request for how to deploy Vuls on Ubuntu server. I missed the first half, but I very much enjoyed Dima Bekerman’s workshop “Brace Yourselves: DDoS is Coming“. 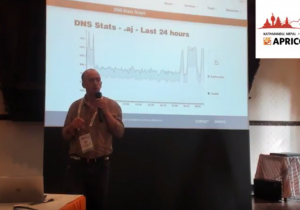 My own co-worker Gaël Hernandez’s talk was of course great to see, “Building and operating a global DNS content delivery anycast network“. It’s always a fun twist to see a presentation intended for outsiders on something that you’re so deeply inside of. While it was plagued with some unfortunate overwhelming of the Hypervisor used for the workshop, Nick Hilliard’s, “IXP Manager Tutorial – Part 2” was a good introduction to introduction to IXP Manager, which I only knew about in concept, not practice. Artyom Gavrichenkov’s talk, “DNS Survival Guide” was a fun history of DNS including up to date comparison of which resolvers are fastest (BIND isn’t even on the list ;). As well, his lightening talk on Feb 28th titled “Memcached amplification DDoS: a 2018 threat” was ridiculously prescient: literally the very next day the largest recorded DDoS hit the ‘net. This was a 1.1Tbps (yes, capital “T” for “Terabit”) attack hit GitHub on March 1st using the Mecached amplification. 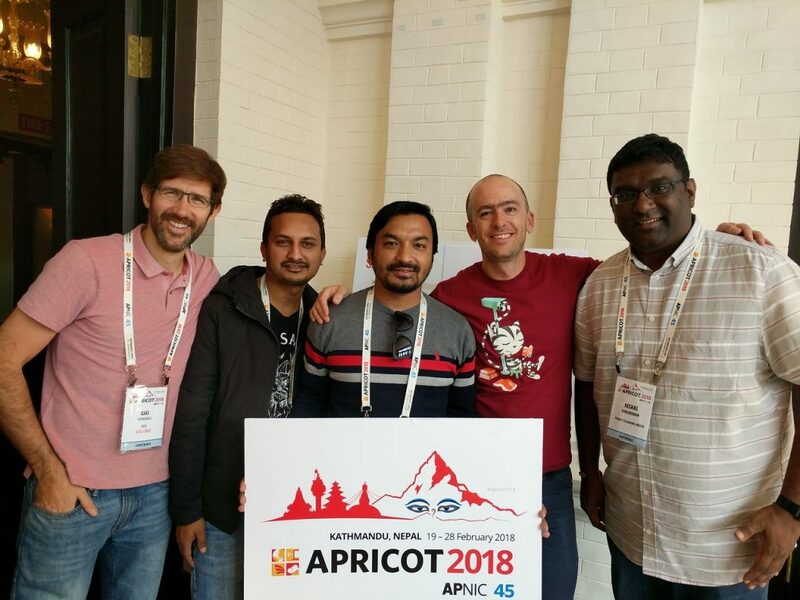 It was a real treat to go to Nepal to attend APRICOT. Like all good conferences, you meet a lot of people that you can network with. I had a lot of fun conversations! Best thing of all about going to APRICOT was that I got to chat with all my co-workers, including two I’d never met before who came all the way from Dublin and Johannesburg. Awesome!